Tim Hortons is giving away a million coffees for National Coffee Day today! Tim Hortons Restaurants is giving away up to a million free Original Blend, Dark Roast, Decaf or Iced Coffees, of any size, to guests who download the Tim Hortons Mobile App, complete a transaction and redeem their offer. 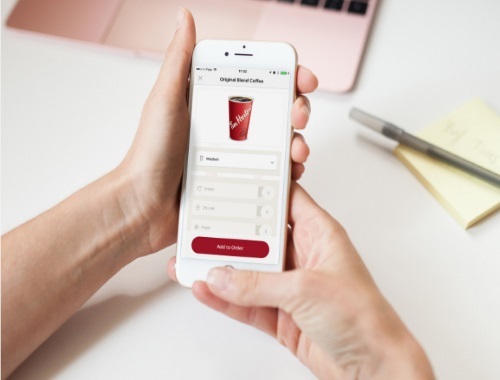 By using the Tim Hortons Mobile App, Guests will be able to select and pay for their order before picking it up in-Restaurant, without having to wait in line, or in the Drive-Thru. The Tim Hortons Mobile App is available to download on the Apple App Store and Google Play Store. Each App user will be eligible for one free coffee after downloading the App and completing a transaction, at participating locations in Canada and the U.S., while supplies last. Completing a transaction requires loading a minimum of $10 into the account (local currency applies) or making a purchase using the App. The offer can only be redeemed through the Mobile App. One offer per Guest, for one-time use only. Please contact your local Tim Hortons to confirm availability.